When the recipient of our service feels that we have gone out of our way, have gone that little bit extra, and done more than they had expected, then that’s where service really kicks in as a differentiator. Great service really allows those who receive it to make the decision that “this place is different”. The consumer makes the mental note that this person looking after them has done more than just the bare minimum. Why even bother giving bare minimum? For the same reason that consumers know and recognise good service, great service and exceptional service, they also recognise and categorise bare minimum service and poor service. And with those categories and levels of service out there for consumers to slot their experiences into, you’d have to wonder what on earth would be the reason for anyone serving to offer poor service or “vanilla” bare minimum service. No customer wants to be treated poorly. No customer wants to be ignored. And with this in mind, why would anyone with the interests of their business or their employer in mind, offer up poor service. Recipients of poor service will always take their business elsewhere. There is so much choice out there now for consumers that the images of the Seinfeld Soup Nazi are purely just fictitious. There’s no product that good that would allow a vendor to behave in such a manner. Well, maybe a government institution. Or the ATO or the IRS? But any decent business with half a brain should be going out of their way to provide each and every customer with some form of “experience”. And as a business owner, in some businesses, there are instances and moments where it is difficult to “put on your best face”. Because some times, there are some moments there are some customers there are some industries, where an experience, where a relationship between consumer and the business, are often not even remotely suggested. If we look at dining out, isn’t our dining experience a better one where our servers are engaged with us rather than robotic? Isn’t it a more pleasant evening when the server makes their own personal suggestions and recommendations on the menu items, rather than just leaving it up to us to decide or worse still, having to ask questions? And if the server recognises a special event at your table then sometimes there are surprise factors that they can initiate that really add to the memorability of the evening. One of our favourite Chinese restaurants always brings out a samurai sword [replica] for diners to cut their birthday cakes cake with. Or other times it’s a giant tree saw. All good fun and all good theatre to make the evening more memorable than “just another restaurant”. Have you ever noticed this amongst your dining companions? In Dentistry the Customer to Dentist relationship can often be just as unfortunately unpleasant. These sort of comments day in day out really can and do grate upon us, as Dentists. So how would it be to turn the attitudes of those who make these comments on their head? That’s quite simple, but difficult at the same time. Commitment to wanting to be better. Knowing that the end result of being better is indeed a better place to be working in. The beauty of offering an environment of greater consistent service is that it allows you to ask for and command a higher fee for your product than those who don’t offer a point of differentiation. And in so offering this service, your customers will recognise that great service is worth that little bit extra. Customers who feel good about the product they purchase are happy to pay a premium for that product because the service has a value. And they value that you’re making a point of difference. And customers who don’t value service, who demand your product, will often decide that the extra freight you charge is not worth the spend to them. The increase in service and the associated premium fee go hand in hand in creating a more pleasant environment with far more pleasant customers. It’s a win for the customer. It’s a win for the employees. It’s a win for the business. I spoke last night on the phone to a Dentist who had recently attended one of my One-Day Workshops. He told me that one of his big take-aways from the day was the fact that not everyone would appreciate the extra attention to service, but that those who did, would add value as a result of the “connection”. And so he immediately saw the benefit in his practice, of “raising the bar”. For more details about my Australian workshops in July August and September, CLICK HERE. 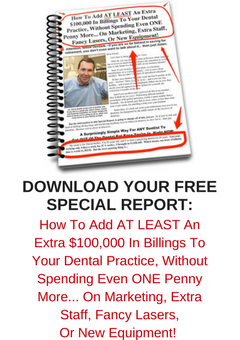 Is Your Dental Office A Rabble? I’m always surprised at the things that go on in the everyday running of a Dental Office. A lot of it makes no real sense. I cannot fathom what logic even exists for the employees of a Dental Office to even expect that they can turn up, and be paid to work in a facility, yet they have the expectation that they can practice dentistry, speak, and behave, in their “own style”, rather than in the way that the owner of the facility requests. Why do employees, with no skin in the game, no money down, turn up and treat patients and speak to patients in the way they want to rather than the way that the owner of the Business asks them to? Where the heck does this mindset come from? Is it because most Dentists, as Owners, are so poorly trained in Business Skills and Human Resources? Are they even trained in these skills at all at Dental school? Could you imagine an NBA basketball team that operated under those same principles? Firstly, who would invest in such a rabble? Why would anyone allow a group of players to enter a court without preparation, skills practice, play rehearsal, a mission, and a game plan? It would just be a mess! Yet most Dental Offices teams don’t have a common game plan, don’t have a mission, don’t prepare, never rehearse and rarely practice verbal skills and training moves. Most Dental Offices just make it up as they go, practicing with live bullets on real time patients, on the phone and in the Office. What we really should see, always, is a Dental Office with a true Mission and common purpose and a dedicated plan of preparation and training. Where all those who work there have a common purpose, and are trained to work towards and behave and produce for that common purpose. Not to work with their “own style”. Could you imagine a visit to a McDonalds store where everyone worked with their “own style”, rather than follow the franchise manual? It is testimony to McDonalds that they have developed a global best practice system that has predominantly teenage employees following a set system, doing all things in a designated pre-determined way, saying pre-determined things that have been well thought out, as well as practiced and rehearsed. What makes one Dentist come into a Dental Office and treat disease, while another Dentist, in the same Office just wants to put a watch on things? Watches are things that you put on your wrist. They don’t go on teeth! Why is the average New Patient value for one Dentist in an Office considerably different to that of another dentist? Why do two different hygienists in the same Dental Office have two different sets of figures when it comes to the ratios of patients in maintenance on three-monthly versus six-monthly programmes? Why are some front office people fabulous with Appointment scheduling, yet others seem to be accepting higher cancellation and reschedule calls? How has it come about within the profession that this sort of dichotomy even exists between two people employed to do the exact same roles within the same Dental Office? In reality, consistency of delivery should be paramount in the Core Values that the business operates under. Consistency then provides a stable level of expectation for our valued Customers, Clients and Patients. So that they speak highly of our Dental Office. Consistency of Delivery also then provides employees and Dental Office Owners with a level of expectation as to how the business will perform, along with an expectation of the long-term future and viability of the business. We owe those expectations to our customers, to our Owners, and to our Team members. Behaviours and practices that do not work toward those consistencies need to be addressed. All Dental Offices should operate under Best Practice principles. With clear and defined guidelines and protocols. It’s a #1Amazon Best Seller! I’m always excited to receive my weekly edition of The Shepard Letter. It’s an email from Shep Hyken, a Customer Service Guru from St. Louis Missouri. If you’re interested in improving your Customer Service, and you’re not subscribing to The Shepard Letter, well frankly, you need to be. This week’s letter was another cracker from Shep. Shep explained that he’d just experienced one of the worst cab rides ever, and upon reading the email, I’d have to agree that the experience Shep had, was downright poor, to put it mildly. The driver turned up late, and moaned and badmouthed the company she worked for. During the ride the driver radioed ahead to base that she was quitting and returning the cab straight after this trip. With my friend Shep still in the cab! Now, I’d like to draw your attention to Shep’s summation of this “experience”. I’d like to ask you to ask yourself, are any of these traits that Shep experienced in his cab ride, occurring in your business? If they are, then you need to address them ASAP and excise these behaviours from your Office. Nobody should ever have to go through the horror of an “experience” like this cab ride. The best exponents of Customer Service are always observing, always on the look out for examples of great service, and sadly, examples of poor service. If you want to improve the service in your own business then you need to develop the trait of “observing” and watching what’s going on around you. And applying those lessons back into our own businesses. 1. Show up on time. Anything else is disrespectful, destroys confidence and can ultimately cost you business. As Shep says, be respectful of your clients’ time. Anything else is just plain rude, and disrespectful. 2. The customer is not your therapist. It doesn’t matter how bad your day is, don’t burden him or her with your problems. Your job is to take care of the customer, regardless of how you feel. This is a doozy and so evident in Dental Offices. There are times I walk past a treatment room and wonder whether there’s an Optometrist in there…it’s always a conversation from the Dental Assistant about I, I, and I. So many I’s you’d think it was an Optometry convention. The most important person in the room is always the Customer. The patient. Ask questions of your patient. Make sure you have your patient talking about them, or their favourite subject, which is also them. Your conversations with your clients, customers and patients should always be about them, and them only. 3. Don’t air your dirty laundry in public. You may not like the company you work for, but you should still be respectful. They are paying you to do a job, so do it well and represent the company to the best of your abilities. This is just poor form. Nothing short of poor form. There is no upside to you or your company, in having you mouthing off about your employer, or their business. It only goes towards making you look stupid in your Customer’s eyes. 4. When you are in front of your customer, you are your company. You represent the company, their brand, and all of their employees. You have the power to give the customer a great experience – or not. Anything you do, positive or negative, reflects on the company – so seize it as an opportunity to amaze your customer! Pull yourself together, get your stuff together and do your stuff. Reflect your uniform, and your pride in your organisation. Nobody respects someone with their hand out on one side, while they give lip on the other side. It’s a #1 Amazon Best Seller! Are You Letting Your Patients Down? I spent three days last week attending a non-Dental marketing meeting attended by some of the great thought leaders. And interestingly, there were a significant number of Dentists and Dental industry people in attendance, to let you know that this was indeed a place of relevant importance. It was an intense meeting. Three full on days from 8:30am to 9:30pm, then 8:00am to 9:15pm and 8:00am to 3:30pm. Jam full of serious marketing information, on how to really look at the marketing of your business. For any business, but easily applicable for a Dental Business. Well I say that if that were true, then why bother putting on a clean shirt and polished shoes? If all we’re meant to be doing is offering our professional opinion, then what we look like, and how we look and how we present should have absolutely nothing to do with anything, because it’s our professional training, and our professional opinion that our patients are coming to see us about. Well heck, why should we even shave or comb our hair, then? Truth be told, marketing and “selling” of Dentistry and Dental Services is just as important as the doing of the Dentistry. It is our role as Physicians to diagnose and present and treat all the disease and illness we see in our patients. And to do that we need to be masters of communication and influence. Not because we want to coerce and deceive and “trick” our patients into having their dentistry. We need to be masters of persuasion and influence because way out there, in the big wide world, there are so many other *Big Shiny Objects* competing against our Dentistry in the minds and the wallets of our patients. And that’s before we even look at and consider the increasing supply of Dentists and Dental Service providers out there competing for the Dental Dollars of the community. Fact is, that most Dental Disease is passive aggressive. It’s often painless and uneventful. It can manifest itself and reveal its presence only at the last minute, when treatment via routine means may be too late. As such, because of this hidden lack of urgency and awareness, the simple act of presenting treatment needed to the client or customer can become quite complex and difficult. In an ideal world, presenting a wound or purulent sore, on the outside of the body, is a simplistic alternative. As Dentists, in the patients’ eyes, we’re often diagnosing the invisible. And as such, by virtue of this, we need to be on top of our game and be masters of our craft. The craft of marketing the importance of treating and completing all diagnosed Dental illnesses. Because our failure to master our craft only creates Dental liabilities. If we do not present all that we see, and complete all that Dentistry, then we have failed our Customer. We’ve created a Dental liability. A liability waiting to happen. And that’s not fair on the customer. Because pain, and discomfort and inconvenience can rear its ugly head at the most inopportune and inconvenient and inappropriate times. It is our role as business owning physicians, to make sure that we do not add to the Dental liabilities of the community in which we work. It is our role as business owning physicians, to master and hone the necessary communication skills and techniques that result in our valued patients not only wanting to have their Dentistry done, but wanting to have it done sooner. Our role is to create a culture of patients who not only leave with an appointment, but who leave wanting to bring that next appointment forward. And are happy to receive a call to do so, if an earlier appointment arises. And a world like that is possible, with the right communication skills. If we fail to communicate the necessity and urgency of the treatment we see is needed, then we are allowing our customers to go out into the big wide world and spend their dollars on electronics, and travel, rather than their health. Our role is not to allow the uneducated to determine the urgency and necessity of their health. Our role is to treat. Our duty, to our community, is to be as good at completing that treatment as we can be. By doing anything less, we’re not doing anybody any favours. Is Simplification The Answer To Your Problems? I’m a little out of kilter writing this blog because I’m in a lounge at Cleveland Hopkins Airport on my way home from a fabulous trip to the US. On this trip I’ve attended two meetings, one an annual conference and the other a special meeting of marketers. Along with those meetings I’ve managed to visit with my good friend Dr Ron, and I’ve also enjoyed an evening meal with one of my clients and his wife. I’ve also used the visit to connect and reconnect with significant international contacts and friends that I often only see virtually. You could say that the trip has been a success on many counts. The important thing to take from this is the fact that there are many doors along our journey that we can swing open and keep open as we travel the roads of life. You never ever know who is going to want to connect, and when they are going to want to connect. And it seems pointless and futile to travel life’s roads without an open mind that the pennies are going to drop into place during that journey. Over the past three days I’ve been attending a [non-dental] marketing education event in Cleveland Ohio. My mind is still spinning because of all of the awesome information that I have learned and gleaned at this meeting. It was a great opportunity to network and share with non-dentists, as well as Dentists, who were attending the meeting. It really was a meeting of the cream of the cream in marketing. One of the subjects discussed that really hit home to me was the discussion concerning the Power of the Reduction of Variables. Sometimes in business, and as Dentists in general, we tend to try to complicate and make complex those systems and processes that need to be kept simple. Sometimes it is about simplification. Sometimes we as Dentist owners like to just try and complicate our own processes for the sake of complication. Yet reduction in steps, reduction in processes, may in fact be the key we need to succeed. Complication may produce a better result for our top producers, but may indeed be inhibiting our bottom producers to the detriment of our business. A streamlining of processes and protocols may result in a dramatic increase in performance by our more challenged team members, and with that, we will see our floor raised to a better more productive level. The reduction in contrast between our top performers and our lower performers will result in a more productive and more unified team, far more than if we left them to their own devices. Because our attempt to “narrow the gap” is so successful, we see an instant improvement. Now sure, there will always be those over-achievers that we employ who will always want to go Above and Beyond at every opportunity. Reduction in variables will not affect their businesses. What it will do will be that it will create a more simplified approach towards the way we deal with and manage our crises situations, especially for our challenged team members. The results to us, as a result of this simplification, can be dramatic. Are you, as a Dental Business Owner, creating unnecessary complex hurdles, that are holding back the majority of your team? Could simplification of processes be the answer you need, to allow your business to advance to a higher level?